The first Imiola Church was a grass hut built by order of the local chiefs for traveling missionaries. No construction date has been found for the first church, although it had been built and dedicated by King Kamehameha III before 1832. It contained a rough pulpit and a crude window. Congregations sat on mats on the ground and often were so large that the tiny structure could barely accommodate them. Reverend Lyons wrote in his journal that at least one hundred little grass schoolhouses were scattered around his church in the immediate Waimea area. Imiola Church’s membership, combined with that of Reverend Titus Coan’s church in Hilo, accounted for three out of every four church members on all islands in May, 1838. Lyons’ triumph was short-lived, however. Of the nearly 5,000-natives who became members during the peak period of religious revival, only 1,197 were in good standing by 1841. By February of 1843, the first church had been torn down and was replaced by a stone structure with thatched roof and windows. Hundreds of natives helped in the collection of stones, often carrying them miles to the construction site. Difficult as the raising of the second church was, the structure lasted for only a little over twelve years. At the end of April, 1855, it was determined to be unsafe and was abandoned. On June 11 of that year, the roof collapsed and was described by Lyons as “a mass of ruins”. On August 29, 1855, the cornerstone of the new church was laid. By 1857, the church was completed and dedicated. The ceiling rafters, floor, and exterior clapboard were made of koa, a Hawaiian hardwood. Lyons’ recollections of the construction of the building list two important figures. Mr. Cairr “was engaged to put up the new building” and Alani was responsible for planing the clapboard siding. The church was constructed by the help of church members who did most of the heavy work. Imiola Congregational Church is a rectangular wooden gabled structure which makes use of indigenous construction materials. The church measures approximately 40 by 60 feet and is set on stone footings and a dry fieldstone wall. It is sheathed with bevel siding. Shingles cover the solid NE end and located on the opposite end is a small gabled entrance way with a curved lintel piece. A rectangular tower with crenellations and a cross crown the high-pitched gable. By 1882, the church required repairs and between the money donated and funds collected at a church fair, Imiola was reshingled, repainted and rematted. Competition with the Catholic Church, the drastic drop in the Hawaiian population, as well as the movement of many natives to coastal urban centers accounted for the dwindling congregation. Two years before his death, a crowd which included Waimea’s young, old, middle aged, Catholics, Mormons, Protestants, and non-believers all came to one of Lyons’ services to honor him. As was the practice, the early missionaries learned the Hawaiian language and taught their lessons in Hawaiian, rather than English. In part, the mission did not want to create a separate caste and portion of the community as English-speaking Hawaiians. In later years, the instruction, ultimately, was in English. He was lovingly known to Hawaiians as Ka Makua Laiana, Haku Mele o ka Aina Mauna – Father Lyons, Lyric Poet of the Mountain County. Lyons was fluent in the Hawaiian language and composed many poems and hymns; his best known and beloved work is the hymn “Hawaiʻi Aloha” sung to the tune of “I Left It All With Jesus” (circa 1852.) The song was inducted into the Hawaiian Music Hall of Fame in 1998. “The first appearance of “Hawaiʻi Aloha” in a Protestant hymnal was in 1953, nearly 100 years after it was written. Today, people automatically stand when this song is played extolling the virtues of ‘beloved Hawaiʻi.’” (Hawaiian Music Museum). He was a citizen of the Islands and fluent in the English and Hawaiian languages; he composed many Hawaiian poems and songs. He wrote a song that expressed feelings for the Islands; shared my many, then and now. Next time you and others automatically stand, hold hands and sing this song together, you can thank an American Protestant missionary, Lorenzo Lyons, for writing Hawai‘i Aloha. Hawaiʻi Aloha was written by a Protestant missionary, Lorenzo Lyons. Reverend Lorenzo Lyons was fluent in the Hawaiian language and composed many poems and hymns; his best known and beloved work is the hymn “Hawaiʻi Aloha” sung to the tune of “I Left It All With Jesus.” He wrote it in about 1852. Click HERE for a link to Hawaiʻi Aloha – sung by Ledward Kaʻapana, Dennis Kamakahi & Nathan Aweau – written by a missionary. Collaboration between native Hawaiians and the American Protestant missionaries resulted in, among other things, the introduction of Christianity, the creation of the Hawaiian written language, widespread literacy, the promulgation of the concept of constitutional government, making Western medicine available and the evolution of a new and distinctive musical tradition. Some songs were translations of Western songs into Hawaiian; some were original verse and melody. Hawaiʻi Aloha is an example of the music left as a lasting legacy by the missionaries in the Islands. Hawaiʻi Aloha was not the only popular song written by the missionaries. One of the unique verses (sung to an old melody) was Hoʻonani Hole ‐ Hoʻonani I Ka Makua Mau. 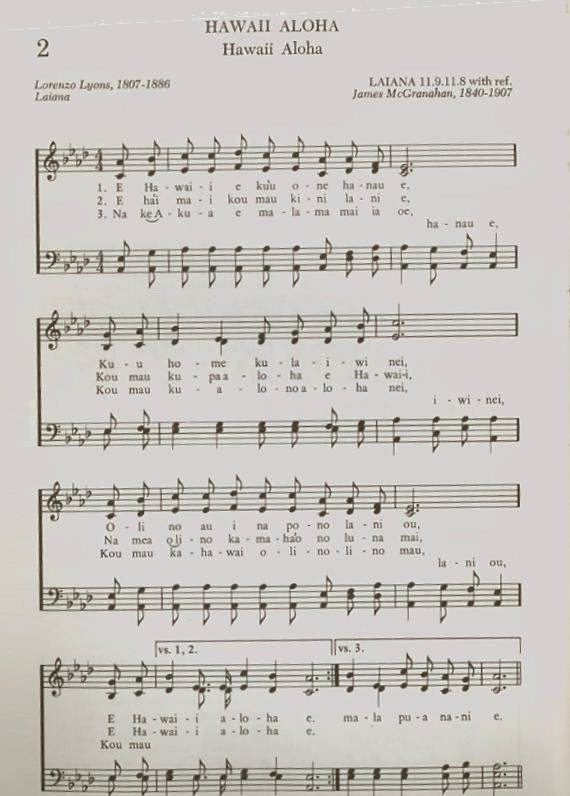 Missionary Hiram Bingham wrote/translated it to Hawaiian and people sang it to a melody that dates back to the 1600s – today, it is known as the Hawaiian Doxology. “The Hawaiians owe entirely to his exertions their introduction to modern enlivening styles of popular sacred music.” (Hawaiian Gazette, October 19, 1886) The image shows the Hawaiʻi music and lyrics. The family name was originally Lyon, to which his grandfather, David Lyon, arbitrarily added an ‘s.’ The Lyon or Lyons family traces its descent back to the time of the Norman Conquest and William the Conqueror. The first of the family to immigrate to America was William Lyon, who went from London to Boston in 1635. Lorenzo and Betsy Lyons arrived in the Hawaiian Islands as missionaries of the American Board of Commissioners for Foreign Missions (ABCFM,) arriving on the ‘Averick’ on May 17, 1832. They were part of the large Fifth Company, including the Alexanders, Armstrongs, Emersons, Forbes, Hitchcocks, Lymans and others. 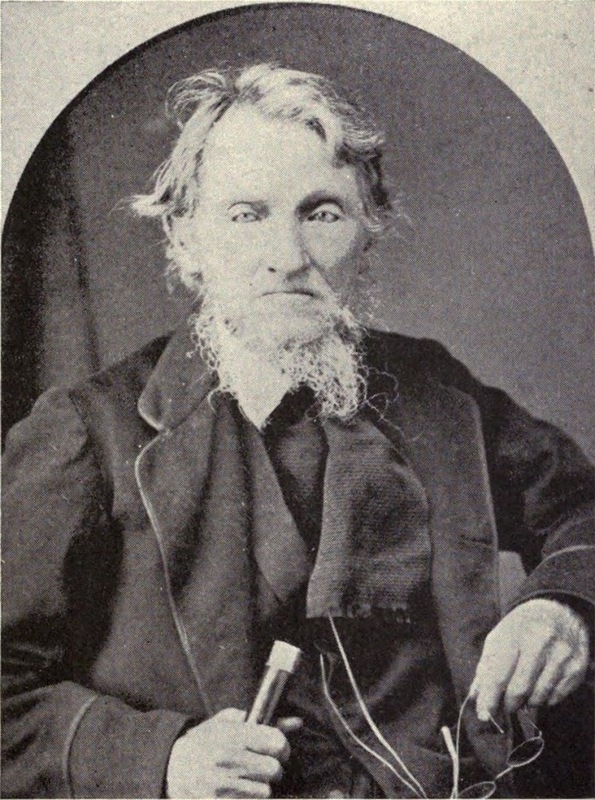 On July 16 1832, Missionary Lorenzo Lyons replaced Reverend Dwight Baldwin as minister at Waimea, South Kohala, Hawai‘i. Lyons’ “Church Field” was centered in Waimea, at what is now the historic church ‘Imiola. “To be alone in this wide, desolate and lone region, 40 or 50 miles from any missionary brother, and no physician nearer than Oahu, is unpleasant. But to have the care of so many thousands weighing upon me is unsupportable. Pray for me”. He stayed, stuck to it, succeeded and spent the rest of his life in Waimea. His base was at ʻImiola Church in Waimea. The first ʻImiola Church was a grass hut built and dedicated sometime before 1832 by King Kamehameha III. Lyons wrote in his journal that at least one hundred little grass schoolhouses were scattered around the immediate Waimea area at that time. On July 14, 1838, he married Lucia G. Smith of Truxton, New York. By February of 1843, the first ʻImiola Church had been torn down and was replaced by a stone structure with thatched roof and windows. Hundreds of Hawaiians helped in the collection of stones, often carrying them miles to the construction site. However, it ran into disrepair. On August 29, 1855, the cornerstone of a new church was laid. “Under the cornerstone (SW corner) was deposited a tin box wrapped in mamaki kapa – Hawaiian Bible, hymn books, newspapers, laws, etc.” (Lyons) By 1857, the church was completed and dedicated. The ceiling rafters, floor and exterior clapboard are made of koa. “Widely regarded as Hawaiʻi’s second anthem, this hymn is sung in both churches and public gatherings. It is performed at important government and social functions to bring people together in unity, and at the closing of Hawaiʻi Legislative sessions. The first appearance of “Hawaiʻi Aloha” in a Protestant hymnal was in 1953, nearly 100 years after it was written. Today, people automatically stand when this song is played extolling the virtues of ‘beloved Hawaiʻi.’” (Hawaiian Music Museum). After leaving the mission, he stayed in Waimea. He was known in the town as the man who carried out many functions. In October, 1854 Father Lyons became the first official Postmaster of Waimea, a post he held until he was very old. The Honolulu Directory of 1884 listed him as pastor of ʻImiola Church, postmaster, school agent and government physician. Lorenzo Lyons died October 6, 1886. He was buried some distance from the church on the grounds of his old homestead. In April, 1939, his remains were moved to the grounds of ʻImiola Church, Waimea, South Kohala, Hawaiʻi. The image shows Lorenzo Lyons, Makua Laiana. In addition, I have included other images in a folder of like name in the Photos section on my Facebook and Google+ pages. Over the centuries, and even today, Waimea was an attractive draw with ideal climate and soils, and moderate distance from the ocean. Still holding remnants of a cowboy town, it looked very different in centuries past – with transformation of forest lands, to agricultural fields, to pasture lands. Now upper pasture land, archaeologists and others suggest the upper slopes of Waimea was a forest made up of ʻōhiʻa, koa, māmane, ʻiliahi (sandalwood) and other trees. Pili grass and shrubs were also found. Within these forested uplands, you could find a variety of forest birds, ʻiʻiwi, ʻelepaio, ʻapapane and others. Fossil remains of a flightless goose have been found in the region. The population began to increase dramatically around 1100 AD and the west side population doubled every century. (Kirch) The population of the islands reached a peak in about 1650 AD, with a total of several hundred thousand. Waimea’s initial population (probably first settling in the 1100s – 1200s) likely grew into a fairly large community. Settlement areas expanded into the hillsides and out onto the drier Waimea plains. Once the advantages of living in Waimea were known, the population quickly grew. Terraced agricultural plots expanded and more of the forest was removed. The upper slopes of Waimea are said to have supported more than 10,000-people prior to contact. Post-contact brought further changes – two major modern land-use practices transformed the landscape – first, the harvesting of sandalwood, which was shortly-followed by the management of the cattle herds. Early Hawaiians first altered the landscape by clearing the forest and plotting out agricultural fields; later, introduced species took over. Waimea, we used to call it home – I miss it. 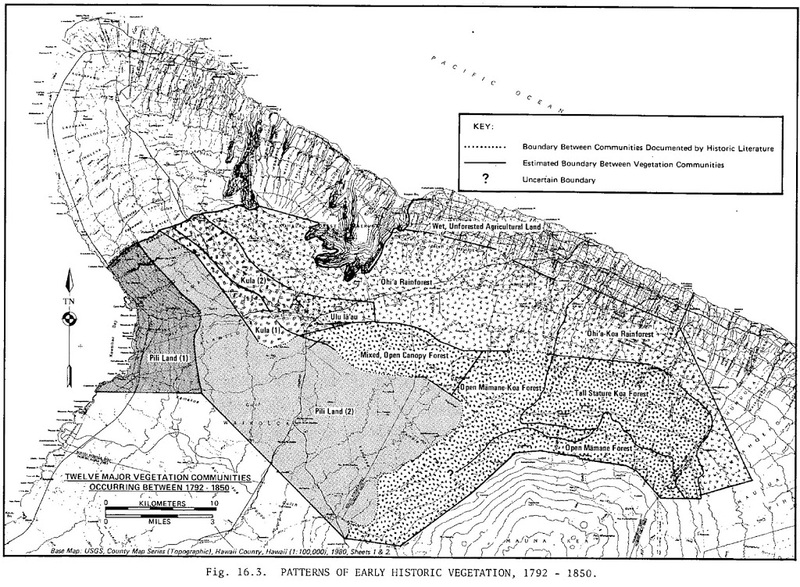 The image shows a map of early vegetation in and around Waimea (McEldowney.) In addition, I have included other images in a folder of like name in the Photos section on my Facebook and Google+ pages.